Fast forward years ahead, I forgot about that taste. Sure there are still brownies everywhere, but the thing is, here in Indonesia people seems to love all things fluffy and light. The would cringe over a rich dense butter cake, and would say it was a failed cake. Same goes with brownies. We have somewhat a very popular steamed chocolate cake, that’s being marketed as steamed brownies. I mean, come on, it’s a cake, do not call them brownies! 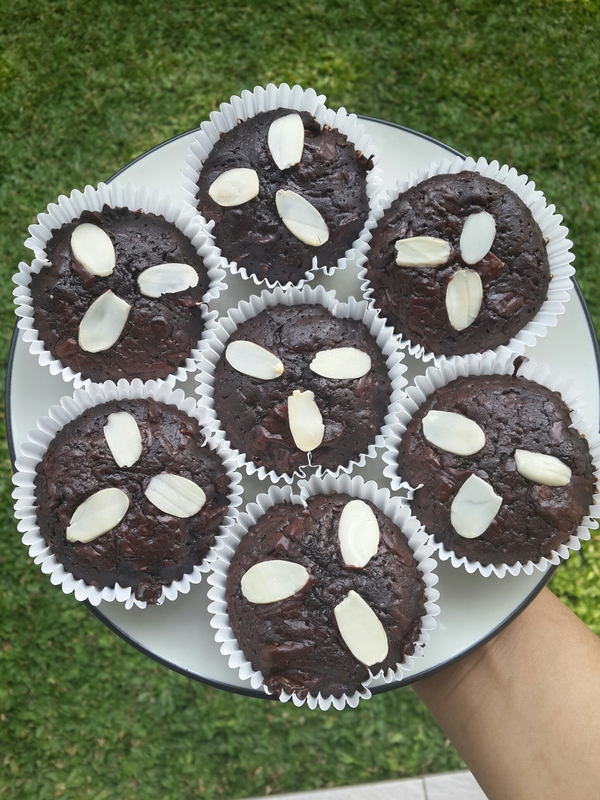 The best you can find are the brownies that are cakey. A bit dense, heavy, chocolatey, but by any means, never ever fudgy. So when I came across this one particular nice lady in a facebook cooking group, Dana, who shared her pride and joy brownies recipe, and very vocal about the origins of brownies, and how it’s supposed to be like, I knew it right then, I gotta, have, must try her recipe! And thanked God I did, because her recipe is the bomb! That’s it, I was taken back to my childhood, munching on brownies that this time also blackened my teeth. So, this recipe is my own version with some tweaks over the ingredients. Please do visit Dana’s blog for her original recipe, and try them as well. Scroll down for the Indonesian version recipe. 1. 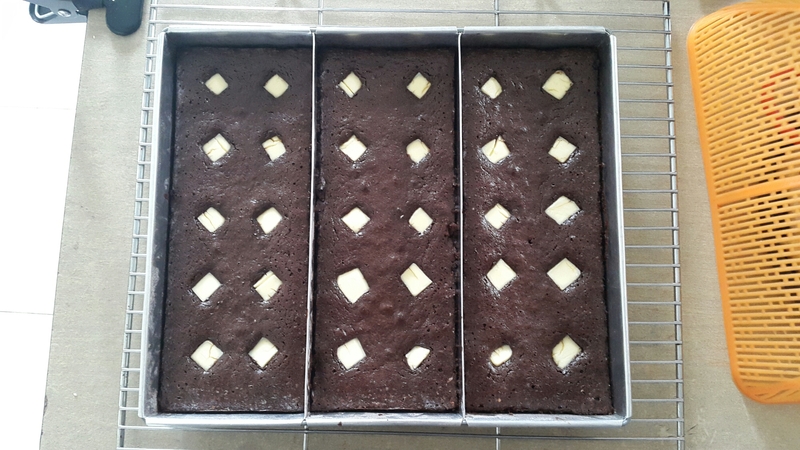 Preheat oven to 175°C, prepare 3 of 25 cm x 10 cm brownies pan, lined with baking paper. 2. Mix butter, sugar, dark cooking chocolate, cocoa powder, coffee, and salt in one pan over the stove in low heat. Stir until all the butter and chocolate dissolve. Pour over to a big bowl, let cool. 3. Add vanilla extract, then stir hard with wooden spatula, while adding the eggs one by one. Stir until the mixture is uniform and glossy. 4. Add the flour into the mixture and stir again until it became glossy again. 5. Pour over into the brownies pan, add the diced cream cheese (optional), bake for at least 25 minutes to 30 minutes. 6. Let cool in rack than put in the refrigerator at least for one hour before serving. 1. 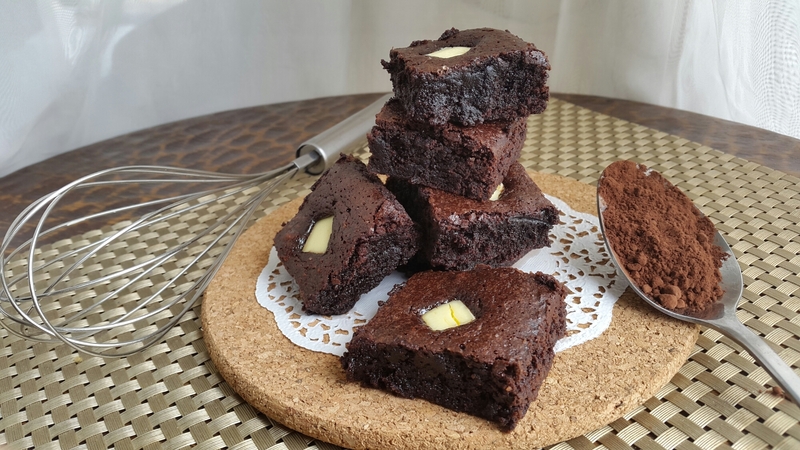 Panaskan oven di suhu 175 derajat celsius, siapkan 3 buah loyang brownies ukuran 25 x 10 x 4, olesi dengan mentega lalu beri alas kertas baking. 2. Campur mentega, gula, DCC, coklat bubuk, kopi dan garam di dalam satu panci, panaskan dengan api kecil sampai seluruh bahan tercampur rata. Gula masih akan sedikit kasar dan itu tidak apa-apa. Matikan api dan pindahkan adonan ke dalam mangkok besar. 3. Tambahkan vanilla extract, lalu aduk adonan dengan kuat menggunakan sendok kayu/spatula/whisk tangan, masukkan telur satu per satu. Aduk hingga adonan licin dan mengkilat. 4. Tambahan tepung terigu lalu kembali aduk sampai kembali licin dan mengkilat. 5. Tuang dan bagi sama rata ke dalam 3 loyang. Tambahkan potongan cream cheese di atas adonan, tekan sedikit sehingga setengah terendam. 6. Panggang selama kurang lebih 25 – 30 menit. 7. Dinginkan, lalu keluarkan dari loyang. Simpan dalam kulkas sampai dingin baru dipotong. These brownies look super tasty!